Protein is an essential part of any diet. It’s great for filling up and building muscle, and fortunately great for busy (and hungry!) bodies. And many healthy high-protein snacks are foods you can take to work, the beach, on a road trip — pretty much just about anywhere. But, before you pack your lunch, calculate how much protein a day you should eat. The Recommended Dietary Allowance (RDA) for protein is .36 grams of protein per pound of body weight. To determine your RDA, multiply your weight in pounds by .36, or use this online protein calculator. Also, studies show that individuals should eat about 20–30 grams of protein per meal to keep muscles strong. Luckily, there are many healthy, high-protein foods that meet this goal. And while a small cooler will expand your protein snack options somewhat, taking many of these easy healthy snacks with you is as easy as tossing them in your bag. Here’s a healthy snack list featuring nine of the tastiest high-protein snacks you can bring just about anywhere. In just over 10 minutes, you can hard-boil a couple of eggs (making sure to cool them in ice water afterward for easy peeling), and you’ve got a high-protein snack at the ready. How much protein is in an egg? A whopping 6.29 grams. Eggs are one of the many delicious, high-protein foods that taste great on their own, and it isn’t hard to peel and slice them and toss them in Tupperware for later. 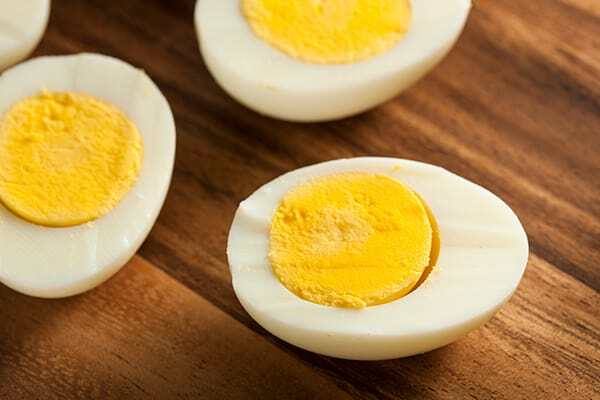 Pro tip: Here’s how to make hard-boiled eggs. Having a portable cooler or ice pack will come in handy for some protein-rich foods. Cottage cheese has a whopping 10.4 grams of protein per 100-gram container. And cottage cheese is “hip” again — and incredibly versatile: Add it to your next pan of mac ‘n’ cheese to cut calories and make it creamy and rich-tasting. Or swap it into any dip that calls for sour cream. Nonfat plain Greek yogurt is another good choice with 6.47 grams of protein per 100-gram container. Both high-protein foods can be enjoyed on their own or with fresh fruit. Just remember to pack a spoon when you’re on-the-go. Canned fish is kind of a love-it-or-hate-it protein-rich food. If you’re in the former category, be thankful, because a typical 6-ounce can of tuna contains 8.2 grams of protein per ounce, and sardines have 6.9 grams of protein per ounce. And since lugging around a can opener is not super convenient, tuna is now available packaged in portable, resealable pouches, making it a much easier high-protein snack to enjoy wherever. 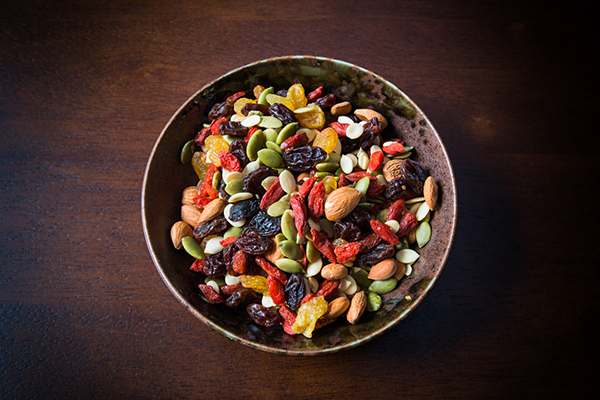 You might not think of nuts and seeds as high-protein foods, but pound for pound, dry roasted nuts and seeds are not just satisfyingly crunchy, they’re regarded as foods high in protein. A typical selection of mixed nuts contains 5.5 grams of protein per ounce, while almonds have 6 grams per ounce, and pumpkin seeds have 5.2 grams per ounce. But the true heavy hitter of this category is peanuts, which clock in at 6.9 grams of protein per ounce. Yep, those steamed soybean pods you eat at a sushi dinner are a high-protein food. With an impressive 18.4 grams of protein per cup, edamame is an easy mainstay if you’re looking for portable, high-protein snacks. Edamame is also one of the few plant-based complete protein sources, which is great news for vegans and vegetarians. With 9.4 grams of protein per ounce (and so many chewy, delicious flavors to choose from), beef jerky is a no-brainer if you’re searching to up your protein intake. It’s important to note that jerky tends to be high in sodium, so it should be eaten with plenty of water. There is also “clean” jerky on the market, such as jerky from grass-fed or organic beef, as well as jerky options without added sugars, fillers, or additives. 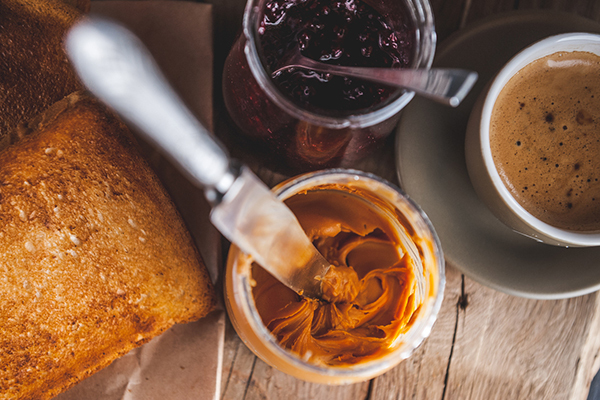 Peanut butter has 7.7 grams of protein per tablespoon, so you can feel OK about eating it with a spoon… just keep the serving size in mind as it’s pretty high in calories. Spread peanut butter on apple slices for an easy high-protein snack in the afternoon. Look for all-natural peanut butters or other nut butters that don’t contain hydrogenated oils or added sugars. The fewer ingredients on the label, the better. Hummus may not be the first food you think of when looking for protein-rich foods, but with 4.85 grams per ¼ cup (the recommended serving), it deserves a spot on your radar. Try making your own hummus with this recipe. With around 17 grams of protein (depending on the flavor) and fewer than 170 calories per serving, Shakeology is an easy, high-protein shake that’s super portable. 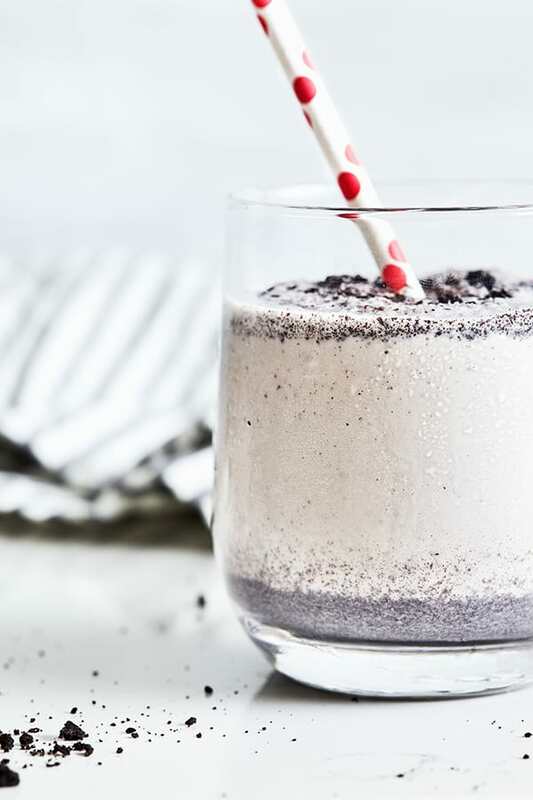 Enjoy it as a shake (one of our favorites is this Cookies and Cream Shakeology recipe) or in one of these yummy Shakeology recipes!